The sub-assembly hierarchy of AGC p/n 2003100-061 is listed below. Minor sub-assemblies and individual components that appear in the drawings but are not listed below may appear in our master engineering-drawing index. 2003036-011, OSCILLATOR MODULE B7, expanded in more detail below. 2003026-011, CURRENT SWITCH MODULE B11, expanded in more detail below. 2003011-011, ERASABLE MEMORY MODULE B12, expanded in more detail below. 2003027-011, STRAND SELECT MODULE B16-17, expanded in more detail below. 2003070-011, INTERFACE MODULE A25-26, expanded in more detail below. 2003120, LOGIC MODULE ASSEMBLY (TABULATED), expanded in more detail below. 2003074-031, TRAY A WIRED ASSEMBLY. Note: The latest available revision of drawing 2003074 ("E") does not contain configuration -031. 2003075-031, TRAY B WIRED ASSEMBLY. Note: The latest available revision of drawing 2003075 ("D") does not contain configuration -031. 2003014-021, ERASABLE DRIVER MODULE B9-10. Note: The latest available revision of drawing 2003014 ("G") does not contain configuration -021. 2003043-021, SENSE AMPLIFIER MODULE B13-14, expanded in more detail below. 2003040-021, ROPE DRIVER MODULE B16-17. Note: The latest available revision of drawing 2003040 ("C") does not contain configuration -021. 2003067-021, INTERFACE MODULE A27-29, expanded in more detail below. 2005912 (sheet 1 and sheet 2), SCHEMATIC. Note: This drawing has been transcribed into CAD files (see the explanation), which can be found in our CAD schematics repository. There is also a folder of visual renderings of those CAD files as images. 2005914, SCHEMATIC. Note: This drawing has been transcribed into CAD files (see the explanation), which can be found in our CAD schematics repository. There is also a folder of visual renderings of those CAD files as images. 2003000-021, HEADER HOUSING ASSEMBLY. Note: The latest available revision of drawing 2003000 ("A") does not contain configuration -021. 2005051C sheet 1, LOGIC FLOW DIAGRAM. Note: Only 2005051B and 2005051D are presently available. 2005051C sheet 2, LOGIC FLOW DIAGRAM. Note: Only 2005051B and 2005051D are presently available. 2005063D sheet 1 or 2005063C sheet 1, LOGIC FLOW DIAGRAM. Note: Presently, only 2005063B and 2005063F are available. 2005063D sheet 2, LOGIC FLOW DIAGRAM. Note: Presently, only 2005063B and 2005063F are available. 2005053D sheet 1, LOGIC FLOW DIAGRAM. Note: 2005053F is available. 2005053D sheet 2 or 2005053C sheet 2, LOGIC FLOW DIAGRAM. Note: 2005053F is also available. 2005069B sheet 1, LOGIC FLOW DIAGRAM. Note: Only 2005069A and 2005069E are presently available. 2005064D sheet 1, LOGIC FLOW DIAGRAM. Note: Only 2005064C and 2005064F are presently available. 2005068B sheet 1, LOGIC FLOW DIAGRAM. Note: Only 2005068A and 2005068C are presently available. 2005068B sheet 2, LOGIC FLOW DIAGRAM. Note: Only 2005068A and 2005068C are presently available. 2005070D sheet 1, LOGIC FLOW DIAGRAM. Note: Only 2005070C and 2005070E are presently available. 2005070D sheet 2, LOGIC FLOW DIAGRAM. Note: Only 2005070C and 2005070E are presently available. 2005050E sheet 1 and sheet 2 (or 2005050G sheet 1 and sheet 2), LOGIC FLOW DIAGRAM. Note: Only 2005050D and 2005050J are presently available. 2005050E sheet 3 or 2005050F sheet 3 or 2005050G sheet 3, LOGIC FLOW DIAGRAM. Note: Only 2005050D and 2005050J are presently available. 2005021, SCHEMATIC. Note: This drawing has been transcribed into CAD files (see the explanation), which can be found in our CAD schematics repository. There is also a folder of visual renderings of those CAD files as images. 2005009, SCHEMATIC. Note: This drawing has been transcribed into CAD files (see the explanation), which can be found in our CAD schematics repository. There is also a folder of visual renderings of those CAD files as images. 2005006, SCHEMATIC. Note: This drawing has been transcribed into CAD files (see the explanation), which can be found in our CAD schematics repository. There is also a folder of visual renderings of those CAD files as images. 2005005, SCHEMATIC. Note: This drawing has been transcribed into CAD files (see the explanation), which can be found in our CAD schematics repository. There is also a folder of visual renderings of those CAD files as images. 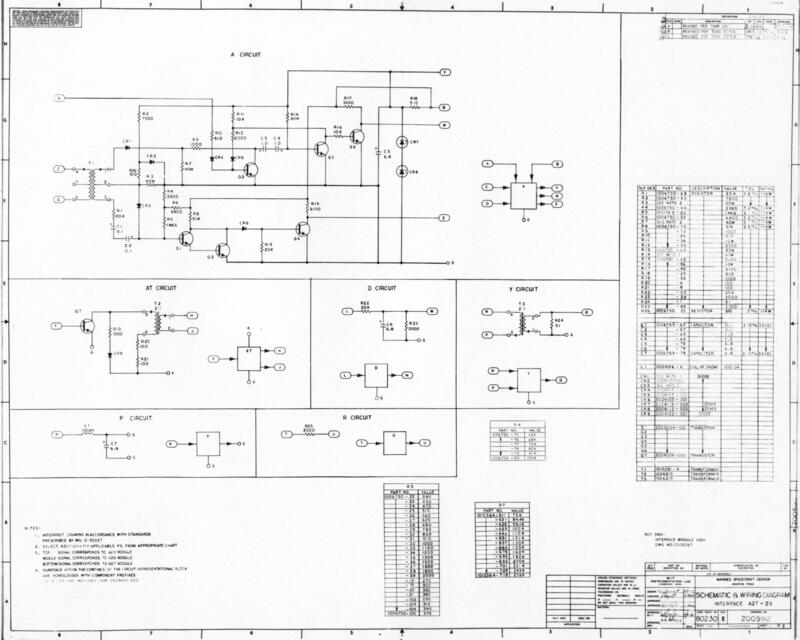 2005003, SCHEMATIC. Note: This drawing has been transcribed into CAD files (see the explanation), which can be found in our CAD schematics repository. There is also a folder of visual renderings of those CAD files as images.